It was called the Town House, the court of the provisional governor, City Hall, and in time became the statehouse of the Commonwealth of Massachusetts. This was the site of Puritan stockades and Boston's first trading floor. The Boston Massacre took place here, and the Declaration of Independence was first read from its balcony. The brilliant red brick building is highly symmetrical and ornamented. Its gambrel roof is obscured by pedimented end facades. Its primary feature is a tall multi-part steeple with elaborate clear glass windows. Also prominent are the lion and unicorn statues (symbols of royal authority) positioned on the gables. These figures were torn down during the celebration of America's independence, and restored in 1882. Beneath the figures are bull's-eye windows, and a ceremonial balcony. The balcony is further ornamented with a segmented pediment over Corinthian pilasters. 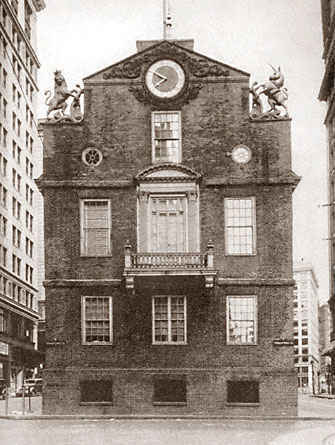 The building's High Georgian style and formal ornamentation suggests that the 1747 State House was designed by a trained British architect, and not an American. The original Boston Town House was the bequest of Robert Keayne in 1657. The bottom of the medieval looking wooden structure was a trading market and gathering place for conducting business. Town and provincial offices were upstairs, as was a meeting hall. Like London, Boston was oriented around the sea. Naturally the Town House overlooked the Town Port. As Boston filled-in its shoreline, this site became ever more inland. 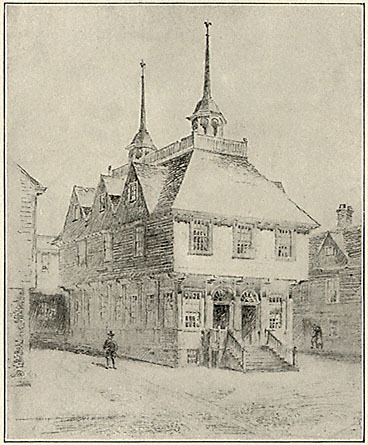 Located on the intersection of the old King and Cornwall streets, the Town House was the center of civic life. Though lost in the great fire of 1711, it was rebuilt by the various government bodies for civic and business use. Today the Old State House has been put to adaptive use. Besides being used for a museum and historic study, it also provides an entrance to the State Street subway stop. The Old State House's shallow foundation provided an area for the subway stops to be stacked beneath it, without having to dig beneath the far deeper foundations of the surrounding buildings.